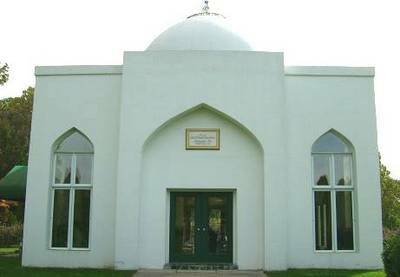 Mausoleum of Sheikh M.R. Bawa Muhaiyaddeen, Coatesville, Pennsylvania, USA, 2009 -- Photograph by MilpitasGraham Via Wikimedia Commons. Ours is a world in which symbols matter, and we look for signs to give meaning to our ways of living. The twin towers of the World Trade Centre in New York, until a decade ago, dominated the skyline of the most famous city in all of contemporary West. The twin towers represented, in every measure of industry, science, finance, politics and aesthetics, the finest achievements of the U.S. as a free and democratic republic and the most powerful state ever in history -- just as St. Paul's Cathedral in London once represented the rising power of Britain or the Taj Mahal symbolized the glory of Mughal India. On 9/11 evil men driven by an evil ideology – Islamism – struck New York and Washington and destroyed the symbols of America's majesty as the land of the free and home of the brave. America's success brought tens of millions of people from all corners of the world to her shores contributing to her glory. But it also generated, and continues to generate, envy, resentment and worse among a great many people who see in America's success their own failures magnified. The twin towers stood proudly on that beautiful late summer morning of 9/11 like flames reaching heavenward. And like gnats drawn to flame, Islamist terrorists flew hijacked jetliners into the towers bringing death in numbers larger than nearly 60 years earlier when Japan's imperial navy devastated the American naval fleet in Pearl Harbour. For a little while following that fateful morning, America in shock and sorrow was galvanized with the unity of purpose to punish the evil perpetrators of 9/11, and also contain and defeat Islamism and Islamists as Americans had done in containing Soviet Communism until its demise. That unity, however, and the resolve behind it, slowly unravelled. Ten years later Americans are greatly divided over the gloomy prognosis of their republic's economic health, as they are divided about the Islamist enemy that remains insidiously active in plotting their evil designs. The empty grounds where the twin towers stood now ironically symbolize the state of America herself – querulous, seemingly in retreat from being the beacon of freedom and, to many of her friends just as to her foes, set on the glide path of decline as has happened with previous great powers. A majority of the present generation of Americans, dwarfed by the greatness of her history, elected a man as their leader most unfit to occupy the seat of Washington, Jefferson and Lincoln. And consequently, the present occupant of the White House signifies a downcast America. The world, especially the freedom-loving people everywhere, cannot do without America's leadership role in all things that matter – in the words of her founding document, life, liberty and the pursuit of happiness. Evil wears an ugly smile estimating the forces of good have been weakened without America at the helm in the struggle of good against evil embedded in the hearts of men. Yet so long as America remains an open society and freedom-loving republic, it cannot be counted down. Her friends on this 9/11 will be praying for her swift return to the special role history assigned her at birth.